Shingo Yabuki (矢吹 真吾) is a high school student who idolizes Kyo Kusanagi and wants to be a hero just like him. 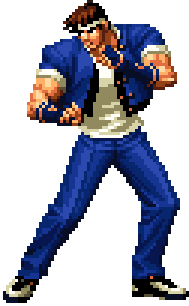 Shingo Yabuki is a recurring character who first appears in the series in The King of Fighters '97 as an edit entry. He is often seen as the comic foil to Kyo Kusanagi. While Kyo was a hero, Shingo is meant to be a "simple and plain, everyday guy". He is one of the cheerful and silly characters in the series. He considers all fighters as his friends, making everybody see him as a weird but good kid. Shingo admires Kyo like an idol, and often dedicates his victories to him. He dreams of being able to wield flames like Kyo, which is stressed to the point of comic relief throughout the series. He replicates several of Kyo's moves sans the flames. He isn't perfect though as he always takes out his handbook if he seems to forget a move. He also "messes up" certain moves (such as the 101 Shiki: Oboro Guruma Mikansei (Unfinished Twilight Wheel), Shingo Kinsei Ore: Mu Shiki, and Shingo Kinsei Oreshiki: Rouka Guruma) where he falls or collapses during or after their executions. This page was last edited on 18 January 2009, at 16:55.